Tonight I used up the final contents of last Wednesday’s CSA box from Sol to Seed Farm. I made a big pot of mixed greens using the Collard and the Kohlrabi greens (which are very similar in texture to collards so the cooking time is the same) that were still quite fresh almost a week later. I used a basic greens recipe inspired by Edna Lewis and Scott Peacock’s The Gift of Southern Cooking (Random House) but in my opinion greens can be made with or without pork stock, ham hock or bacon. I needed to use up the guanciale I purchased from Salumi so I just tossed in a slice for flavoring. 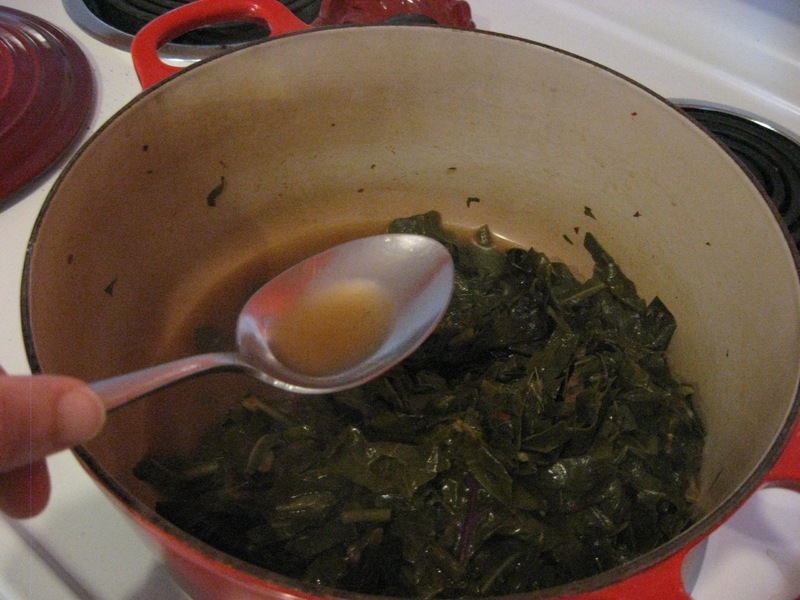 Some say the best thing about Southern style greens is the pot likker. My pot likker is clear and rich broth, flecked with red pepper flakes and a hint of garlic from the scapes. 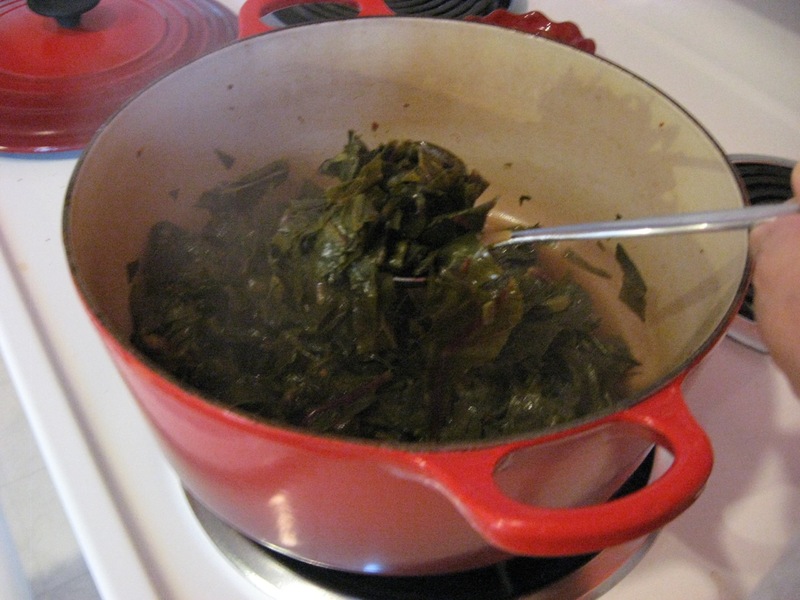 Southern style greens are supposed to be tender and fully cooked. Traditional Southern greens are not bright green and al dente. The recipe below is my spin on Southern style greens based on what I had on hand, but you can use any dark leafy greens (such as turnip, collard, kohlrabi, mustard etc). Just omit the meat all together if you prefer vegetarian. Thinly sliced onions, garlic, red pepper flakes and the like are all good seasonings for greens. Heat a large stock pot on medium high heat and add the oil until hot. Toss in the guanciale (if using) and garlic scapes and stir. Add the chopped greens, water, salt and red pepper flakes. Bring to a boil and then cover and lower the heat to simmer. Simmer for about 1 hour, stirring occasionally. The greens should be tender and no longer bright green. Remove from heat and serve with beans and cornbread (take advantage of the rich pot likker and sop up the likker with the bread) or serve as a tasty side to fried chicken or fish. Don’t waste the pot likker! It’s pure gold.